Thursday, August 3, 1837.Athens, IL. Illinois State Representative Lincoln is in Athens, Illinois, where the town's citizens fete the County's legislators. A newspaper reports, "At one o'clock about one hundred and fifty gentlemen sat down to an excellent dinner," after which individuals offer toasts, including two for Lincoln: "He has fulfilled the expectations of his friends and disappointed the hopes of his enemies." Another calls him "One of nature's nobility." 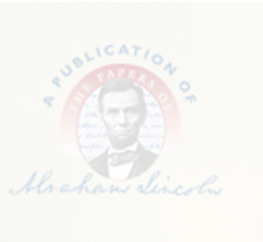 Lincoln responds, "Sangamon county will ever be true to her best interests and never more so than in reciprocating the good feelings of the citizens of Athens and neighborhood." Sangamo Journal, 12 August 1837, 2:5; A Toast Volunteered at a Public Dinner at Athens, Illinois, 3 August 1837, CW, 1:88.